There is no doubt about it, arborists and landscapers face a variety of hazardous conditions when on the job. All too often you hear the news of another work related injury, or even worse, death. As an arborist, it’s not a matter of if you will be injured or experience a close call on the job, but more a matter of when, and when something does happen it’s on a scale of minor flesh wound to emergency room or even death. This summer there have already been two deaths related to tree trimming and landscaping in South Florida, and even more across the country. The first news came in late May when a landscaper was struck in the head by a tree limb, and the second most recently when Plantation City Council Member Jerry Ferdgen fell from a ladder when landscaping his own property. In late June, another arborist in New Hampshire fell 50 ft from a tree raising the number of falling related deaths to 18 this year in the New England area (as reported by the Massachusetts Coalition for Occupational Safety and Health). These deaths remind us of how dangerous it is to maintain the health and wellness of the natural environment around us. Being an arborist is strenuous work where fatigue, dehydration, and even the tiniest insects can cause climbers to lose their positioning and potentially fall from the tree. For the sake of safety and security it is critical that climbers have at least two means of being securely fastened to the tree when working up in the canopy. A climbing line with at least one secure attachment point, and a climbing lanyard are life savers when climbers find themselves in compromised positions. There is nothing more terrifying than falling when high up in the canopy, even when securely fasten into the tree. A close call can set back a job site an entire day, that is if the climber survives the fall, or only suffers minor injuries up in the canopy. Jason Gerrish from @Subtropicalhardwoods, was featured in a cover story from Miami New Times. 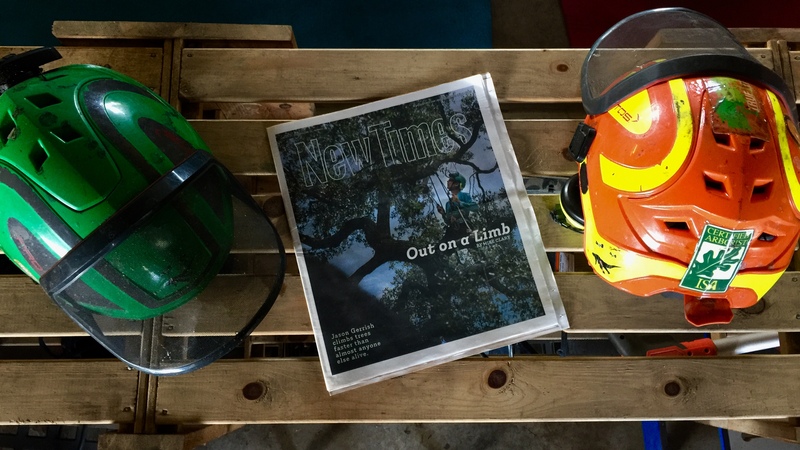 Last month, Miami Native & Arborist, Jason Gerrish was featured in the Miami New Times for being the best climber in the state of Florida after winning the International Society of Arboriculture contest for the 4th time, and . He has been invited to compete in the ITCC (International Tree Climbing Championships) international contest for best climber in the world.! The amount of knowledge, preparation, and experience to compete at this level and be a champion climber is the type of inspiration arborists draw from when going out into the field. The pillars of a successful business model in this field are Safety, Sustainability, and Service. Considering the dangers of arborist work safety must be paramount when dealing with any type of tree trimming or landscape work. As an environmentally conscious business, sustainability, urban forestry, wood reuse & recycling, as well as mulch drops to local gardens and farms help to foster a stronger community. The final pillar of service and support is critical in informing clients of the needs of the job, and developing the understanding necessary of why contracting this type of work is ultimately better for the health of the tree and the safety of any individual who might attempt to do this work alone.